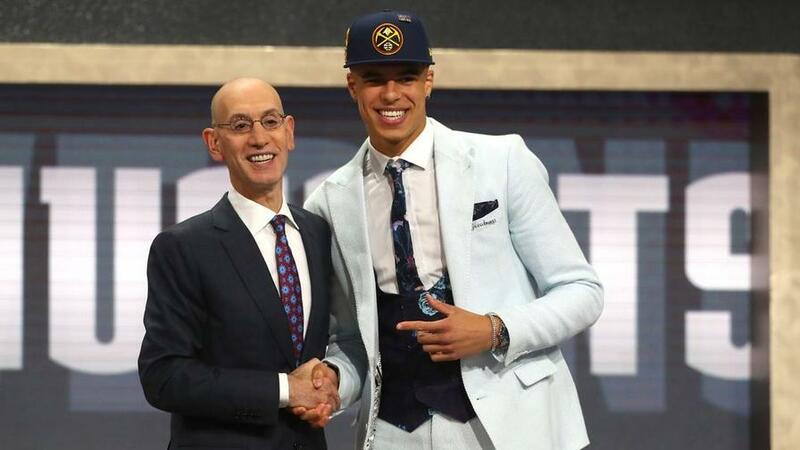 Despite slipping to the end of the lottery, Michael Porter Jr. could step right in and produce in Denver. Which other players' stocks are rising and falling following last night's draft? The NBA Draft is a yearly reminder that as veterans like Dirk Nowitzki, Manu Ginobili and Vince Carter inch toward the end of their lengthy careers, the league is constantly being replenished with young talent. And the same can be said for fantasy hoops. While the days of Dirk, Kevin Garnett and Kobe Bryant as top-five assets are well behind us, five rookies proved to be worth a pick in the first eight rounds of fantasy drafts in 2017-18. According to Basketball Monster's per-game values, Donovan Mitchell led all rookies as the 54th-ranked player, a fifth-rounder in drafts. He was followed by Lauri Markkanen (62nd overall) and Jayson Tatum (65th) in the sixth, Lonzo Ball (80th) in the seventh and John Collins (94th) in the eighth. Even Kyle Kuzma (115th) and Jarrett Allen (142nd) snuck in as 10th- and 12th-round values, respectively. All this is to say that among all the takeaways from the 2018 draft class, don't forget about each pick's fantasy implications. 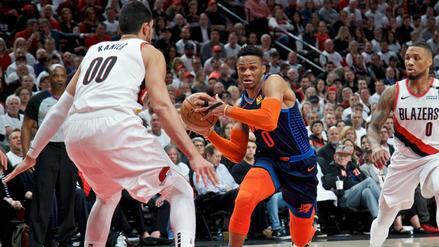 Oftentimes, the pick won't have much of an impact on the player or his future teammates, because rookies aren't as plug-and-play in fantasy hoops as they tend to be in fantasy football. But as you can see from the names above, rookies can be fantasy-relevant. And, even if they're not assets themselves, a handful of minutes or shot attempts can hinder the value of those around them. So let's get down to it and take a look at which fantasy basketball assets -- not just rookies -- saw their stock rise or fall last night. To no one's surprise, Deandre Ayton -- a 7'1" monster out of the Bahamas -- went with the first overall pick in this year's draft. Everything points to Ayton being a valuable fantasy commodity. In his single season at Arizona, the 19-year-old averaged 33.5 minutes per game along with 24.0 points, 13.8 rebounds and 2.3 blocks per 40 minutes. He shot 61.2% from the floor and 34.3% from three, though he connected on just 12 total for the year. With Ayton's combination of size and skill, the first comparison that comes to mind is former number one pick Karl-Anthony Towns. In his lone collegiate season, Towns didn't play as much, but his per-40 numbers -- 19.5 points, 12.7 rebounds and 4.3 blocks -- and ability to shoot from outside lead us to believe that Ayton should thrive in year one. Playing 32 minutes for a team that won just 16 games prior to his arrival, KAT was second on the team in scoring and usage, and he finished as the 12th-best fantasy asset (per game) in standard nine-category leagues. Ayton's rookie situation has a lot of similarities. The Phoenix Suns' 21 wins were last in the league this year, and the big man will be the focal point down low. As Towns was to Andrew Wiggins (27.2% usage rate to KAT's 24.9%) in his rookie season, Ayton should be to Devin Booker, who led the team with a 31.7% usage in 2017-18. If Ayton's able to log 30-plus minutes a night, there's no reason to doubt his potential to hit second- or even first-round value. Contrary to what you might be thinking, the Suns' backcourt doesn't get a bump just because of Ayton's presence. It will certainly have an impact, but it's the Suns' other addition from Thursday night, Mikal Bridges, that makes Booker and Elfrid Payton (or Brandon Knight if Phoenix doesn't retain Payton) more appealing. The Suns were reportedly set to go with Bridges' Villanova teammate, Donte DiVincenzo, with the 16th overall pick, when they were approached by the Philadelphia 76ers with a trade offer, pitching Bridges -- who Philly took 10th -- for the 16th selection and a 2021 first-rounder which Phoenix acquired via the Miami Heat. Phoenix took the deal and added Bridges, a solid all-around swingman best-known for his shooting stroke, as he finished his three-year career averaging 1.5 threes per game on 40.0% shooting at 'Nova. That could help take even more of the scoring burden off Booker, who averaged 24.9 points on 19.5 shot attempts this season. While that could conceivably negatively affect his points and three-pointers, it could provide a boost to Booker's two worst areas: field goal percentage and turnovers. If you eliminate those two categories this year, Booker would have finished as fantasy's 18th-ranked player as opposed to 48th. And for Payton, so long as he's around, this should mean more assist opportunities as well as more open lanes to score efficiently, with more floor-spreading. After joining the Suns on February 8th, Payton averaged 11.8 points and 6.2 assists in 19 games. Over that span, he was the 228th player on a per-game basis, but if you take out his 45.3% shooting and neutralize his 2.8 turnovers -- which you'd hope would also come down, he moves to 135th, a 12th-round value. In a similar fashion, the Dallas Mavericks' addition of Luka Doncic via a draft day trade should have the same effect on point guard Dennis Smith. In his own rookie season a year ago, Smith was just the 9th-best rookie and 119th overall player in 9-cat. And the biggest areas of concern were -- you guessed it -- field goal percentage and turnovers. In logging 29.7 minutes and carrying the load to the tune of a 28.9% usage and 15.0% turnover rate, DSJ struggled, coughing the ball up 2.8 times a game and shooting a pretty lousy 39.5% from the field. He was also poor from three (31.3% shooting), which didn't help his value in the three-pointers department either. It's a stretch, but when you account for three-pointers, field goal percentage and turnovers, Smith was 69th overall due to his strong scoring, assists and steal levels. An incoming 6'7" guard/forward combo doesn't usually do wonders for a point guard, but Doncic isn't just another guy. In taking Real Madrid to the EuroLeague title, he averaged 22.6 points (on 45.1% shooting) and 4.3 assists. In 37 Liga ACB appearances this year, he managed 4.7 per game and racked up 4.2 in fewer minutes in 2016-17. His proven ability to score and facilitate at the highest level should do wonders for Smith's inefficiencies. The hope here is that Doncic can help DSJ tap into his potential. On the other side of the Doncic trade, the Atlanta Hawks moved back two spots (and received a protected first in 2019) to take Oklahoma point guard and college phenom Trae Young. But wait -- isn't Dennis Schroder their starting point guard? Less than two years ago, Schroder signed a four-year, $70 million deal, and over the last 2 seasons he's started 145 (88.4%) of the team's 164 regular season games. But Schroder's reportedly on the trade block. If and when the veteran is shipped out, Young will have a clear path to big minutes. Young won't have the benefit of another main ball-handler, a la DSJ, so it's all about volume for him. That didn't keep him from putting up big numbers at Oklahoma, though. Over 35.4 minutes, Young averaged 27.4 points and 8.7 assists on 19.3 field goal attempts, 10.3 three-point attempts, 8.6 free throw attempts and a 37.1% usage that ranked first in the nation. Atlanta's putting a lot of faith in Young to lead an NBA offense like he did in college. If his 5.2 turnovers are any indication, Young could struggle in at least one category. 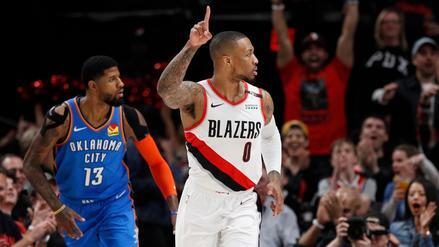 But a fantasy team punting turnovers could push for elite status in points, threes, and assists if he's able to quickly adapt to the NBA game and take full advantage of his opportunity as the go-to guy. Amid concerns over his surgically repaired back, Michael Porter slid to the final lottery spot in this year's draft. Porter seemed displeased as he sat in the green room, but when he went off the board to the Denver Nuggets he was all smiles -- and rightfully so. The 2017-18 season saw the Nuggets fall a single game short of a playoff berth out West, and unlike most teams in the lottery, they're a well put-together team looking to get over that final hurdle. In other words, Porter will be surrounded by big-time talent in the form of Nikola Jokic, Gary Harris, Jamal Murray and Paul Millsap -- all of whom cracked the top seven rounds in terms of per-game value. Of their usual starters, only small forward Wilson Chandler was unable to accomplish that feat, finishing as fantasy hoops' 154th-ranked player and a 13th-round value. With Chandler due to bolt in free agency next season, the Nuggets could look to Porter as the guy of the future as soon as this year at the small forward position. If healthy, Porter could earn his way to a starting role, or at least substantial minutes off the bench. And if that's the case, he should produce. The multi-talented youngster played in just three contests at Missouri, but he was the high school Player of the Year in 2017 and stuffed the stat sheet with 36.2 points, 13.6 rebounds, 5.0 assists, 3.2 steals and 2.7 blocks per game as he led Nathan Hale High School to an undefeated state title. The potential is there for Porter to surpass Chandler's 2017-18 performance if -- granted, it's a big if -- he's given the chance to do so from the get-go. Dating back to 2015, the Sacramento Kings have either selected or traded for a big man on draft night in four consecutive years. From Willie Cauley-Stein in 2015 to Harry Giles in 2017, and now Marvin Bagley III, all but one of those (Georgios Papagiannis, 2016) picks is still on the roster. Furthermore, when you throw in veterans Zach Randolph and Kosta Koufos, the Kings are set to have at least six power forwards or centers under contract for the 2018-19 season. The Kings could certainly deal or buy out a player or two, but right now Bagley's headed to join a frontcourt that saw no player average more than 28.0 minutes (Cauley-Stein) with Randolph at 25.6, Skal Labissiere at 20.7 and Koufos at 19.6 per game. Mind you, that was with Giles -- the 20th pick a year ago -- sitting out the entire season with an injury. In case you're wondering how that translated to fantasy success, or the lack thereof, Cauley-Stein was the best finisher at 123rd overall -- an 11th round value. The younger Labissiere ended the year 229th as he was never given the minutes necessary to reach relevance (at least over the entire season). Just about everything said for Bagley in Sacramento goes for his college teammate and seventh overall pick, Wendell Carter, in Chicago. The Bulls won the exact same number of games (27) as the Kings did this past season, and they too have a surplus of big men. With Carter entering the fold, the Bulls will have six players listed as power forwards or centers under contract. That includes veterans Robin Lopez, who is a free agent in 2019, and Omer Asik, who is very unlikely to see the floor. Never mind the fact that Noah Vonleh -- more of a power forward type -- is a restricted free agent, as the Bulls also have Bobby Portis and Lauri Markkanen to find substantial minutes for. Markkanen will start at power forward, but Portis split his time at the two positions nearly 50-50 in 2017-18. He could be the team's first big off the bench once again. Either way, though, he's a threat to keep Carter from a decent workload in his rookie campaign. Portis himself turned just 22.5 minutes into 11th-round value in 9-cat leagues, and in his third year at that. If Carter's to see around 20 minutes, it's unlikely he -- or anyone not named Markkanen (last year's 62nd ranked player) -- is much help to anyone barring a Lopez trade or rest-and-tank 2.0. 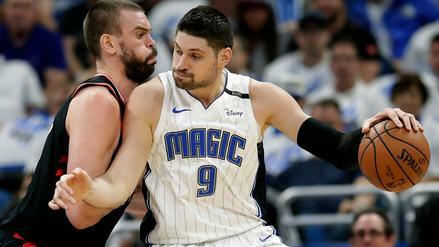 The Orlando Magic aren't as ultra-deep up front, but with the selection of Mo Bamba (at sixth overall) Nikola Vucevic could be looking at a decreased workload in a contract year. The big man is making $12.75 million in the final year of his deal and Bamba's presence almost definitely takes him out of the team's long-term plans. This past year, Vucevic missed 25 games due to injury and averaged 16.5 points, 9.2 rebounds, 3.4 assists as well as 1.1 blocks and 1.0 steals on the defensive end. Averaging 29.5 minutes a game, he even contributed 1.1 threes, up from his previous high of 0.3 the year before. Accounting for his overall contributions, the 27-year-old finished as the 27th-best fantasy performer, though that slipped to 57th based on totals rather than per-game averages. In 2016-17, he ranked 48th while averaging a double-double with similar peripherals in 28.8 minutes. Vuc's efficiency (47.5% shooting, 31.4% from three and 1.9 turnovers per game in 2017-18) plays a major part in his fantasy value, but even a slight decrease in minutes -- to somewhere around 25 to 27 -- could do serious damage. And with the high draft cost and Bamba's ability to influence the game defensively (top four in blocks, blocks per game and block percentage at Texas), we could be looking at an almost identical situation to that of 2016-17, when Bismack Biyombo averaged 22.1 minutes a game as a defensive specialist for the Magic. Unless Vucevic's average draft position (ADP) falls from the fifth round, where it was in 2017, he won't be an ideal target for 2018. Trae Young's standing as a winner comes at Schroder's expense. Young will enter town and Schroder will in all likelihood leave it -- if and when the Hawks find a viable trade partner. Depending on his landing spot, you might find him an intriguing option in a new uniform. But over the past two seasons, Schroder has finished as a ninth- (108th) and eighth-round (93rd) value, respectively. His strong suits have been points, assists and steals, earning negative values in all other areas but free throw percentage, according to Basketball Monster. And this is certainly an issue, as most of his value is predicated on the counting stats that have come courtesy of his 15.4 and 17.1 field goal attempts, and usage rates of 27.8% and 30.4% in 2016-17 and 2017-18, respectively. Schroder won't find that type of opportunity elsewhere, especially if he lands with a better team, particularly one with a respectable starting point guard. His usage rate ranked in a tie for 12th among all qualified players in 2018 with 14 players -- all but two on playoff teams -- joining him above the 30% mark, representing 12 teams with at least one alpha dog in place. So long as Schroder doesn't force his way to being fantasy relevant through volume alone, we're probably looking at a 10th-round asset for 2018. As part of the aforementioned Suns trade, the Sixers got Texas Tech's Zhaire Smith with the 16th pick. Smith is a freak of an athlete and was a projected top-15 pick in his own right, but Philly's original pick, Mikal Bridges, was considered the better prospect -- a top-10 guy and shooter from the outside. And that's why the fantasy values of both Ben Simmons and Markelle Fultz took a hit last night. We've already touched on Bridges' shooting ability, but to take it a step further, 95% of his 104 three-point makes last season were assisted on (according to Jay Bilas on ESPN's draft telecast). For a team that may be without free agent sharpshooter J.J. Redick, who hit 193 threes -- 174 of which were assisted -- in 2017-18, Bridges was just what the doctor order for Simmons and Fultz, who combined for 0 (yes, zero) three-point makes on 12 attempts this past season. Smith isn't the guy to surround the duo with. In his one collegiate season, Smith connected on just 18 of 40 threes. It's a nice percentage, but he projects nowhere close to the type of volume Redick provided the team in '17-18. Simmons and Fultz shot 54.5% and 40.5%, respectively, from the floor and combined for 12.0 assists in 2017-18. We didn't get much of a fantasy look from Fultz, who played just 14 games, but we have to assume he'll rely on drives to the basket and assist numbers. 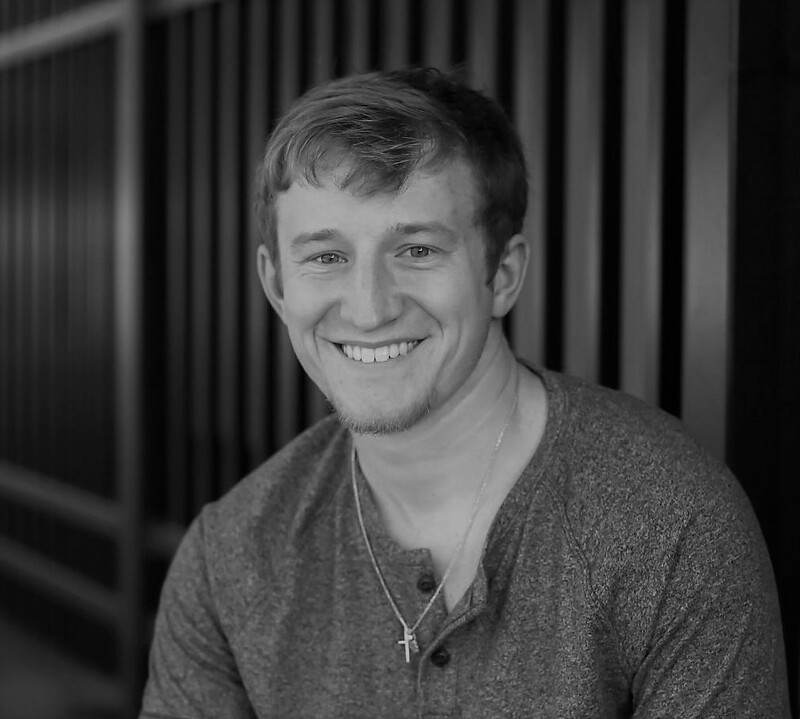 The same has been proven for Simmons, a 5th-round value as fantasy's 51st-ranked player, who provide above-average value in field goal percentage and elite value in the assists column. He and Fultz might just need a Redick replacement if he doesn't return, especially for a team that relied so heavy on the veteran to keep them hovering around the top-10 in most three-point shooting categories as a team. Without him, or someone with his same expertise, we could see the assist numbers -- and possibly the shooting efficiency -- fall for the young Sixers.